As a forward-thinking business, we are always trying to come up with new ways in which our slip-resistant matting can be utilized. One of these new applications is for swim platforms on boats. These areas are normally located on the back of the boat right above the prop. They convert a boat into a veritable swim dock while the boat is anchored. Most of the surfaces on these platforms are textured, however, they often times develop a thin layer of algae, creating a slippery surface. 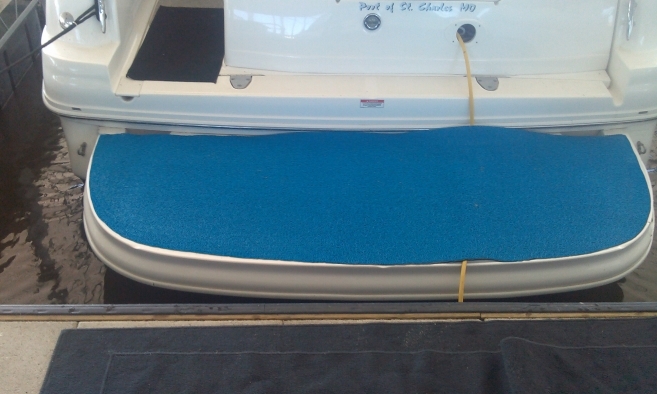 After talking with several boaters who expressed their displeasure with the swim platforms on their boat, we started thinking… could our slip-resistant matting serve as a solution? Depending on the size of the boat and the year, the platform will vary in width and length. Typically, they range from 3” to 6”. Because PEM slip-resistant matting comes in rectangular roles, it can easily fit most swim platforms. Even if your platform is an odd shape of size, don’t worry! Simply take a razor blade and cut the matting to fit your platform. We recommend leaving the matting out in the sun for about 30 minutes. As you can see below, the platform has rounded edges and was cut for the perfect fit. If you would like to order a small role of PEM matting for your swim platform, please visit our Marine Matting page for more information.